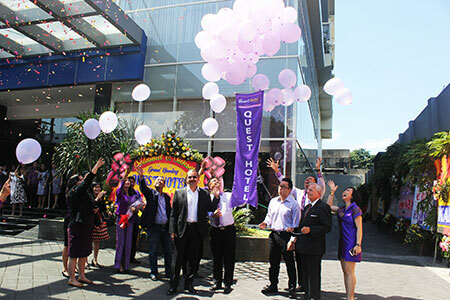 "The grand opening of Quest Surabaya is an important moment for us here at Archipelago International since the hotel is the third of its kind in Indonesia, joining our two other Quest hotels in Kuta – Bali and Semarang – Java. Next month we will be opening two more Quests in Denpasar and Balikpapan, whilst further Quest Hotels are being built in Jakarta, Cikarang and Sentul." Says Mr. Norbert Vas, Archipelago International’s VP Business Development & Operations. Surabaya is Indonesia’s second largest city and the capital of the East Java province. As one of Indonesia’s main trading ports and with its thriving retail sector, it boasts a large and diverse economy. Surabaya also offers many historical tourist attractions for visitors to the area, including old buildings from Dutch and Japanese colonial eras, and traditional art, dance, music and theatre displays. For the twenty-first century traveler, there are also a number of malls and shopping destinations with designer and boutique clothing stores.